The Redcliffe Skin Cancer Centre has been purpose-built to deliver the highest standard of care in Skin Cancer Medicine. We offer a skin cancer service like no other, with a specially qualified team of doctors who provide expert, trusted advice in the areas of skin cancer management. Our doctors are supported by a team of highly trained staff who will confidently address all your skin cancer concerns. Ideally located on the beautiful Redcliffe peninsula, the Redcliffe Skin Cancer Centre provides vital skin cancer services that save lives. We give patients prompt and effective access to screening, diagnosis and treatment all under one roof. Thanks to our dedicated operating theatres and professional support team, patients face short waiting times to receive vital treatment. 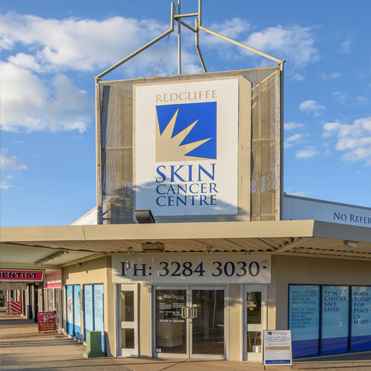 The Redcliffe Skin Cancer Centre is part of the National Skin Cancer Centres. We place a strong emphasis on excellence in medical care, which is strengthened by our commitment to research and education. All our doctors and support staff are involved in the ongoing education of GPs in Australia through university-certified Skin Cancer Medicine programs. experience is as pleasant as possible. billed, patients will fall into one of two categories, "Concession" and "Private". Pensioners: $105 with a $37. 60 Medicare rebate and $67.40 out of pocket. Once-off annual fee, any additional spot checks or reviews will be bulk billed for the year. Non Pensioners: $105 with a $37. 60 Medicare rebate and $67.40 out of pocket. Applies for every visit. All patients are bulk-billed. If the procedures are performed in an operating theatre, additional fees may apply.